We’d love your help. 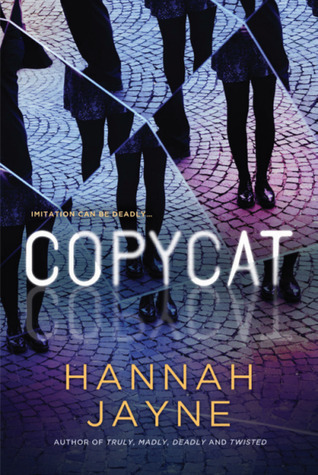 Let us know what’s wrong with this preview of Copycat by Hannah Jayne. But when the most popular girl in Addison's high school is murdered, Addison can't help but think Everyone is dying to read the latest book in the popular Gap Lake mystery series, and Addison is no exception. As the novels biggest fan, Addison is flattered when the infamously reclusive author, R.J. Rosen, contacts her, granting her inside information others would kill for. To ask other readers questions about Copycat, please sign up. Sometimes I like to pick up a book that I know is being published purely as saccharine entertainment. I devoured the entire PLL series as an adult, so I have no issue reading novels where I'm not the target audience and am happy to review them fairly, as I feel I've done here. While many adults won't care for this type of read, I found it overall to be a fun palate cleanser. I've read many of the author's previous books and I felt this was a comparable display of her writing style and plot choic Sometimes I like to pick up a book that I know is being published purely as saccharine entertainment. I devoured the entire PLL series as an adult, so I have no issue reading novels where I'm not the target audience and am happy to review them fairly, as I feel I've done here. While many adults won't care for this type of read, I found it overall to be a fun palate cleanser. I've read many of the author's previous books and I felt this was a comparable display of her writing style and plot choice. My favorite aspect was the dual narrative where we find the fictional Gap Lake world alternating with real time happenings. There are some overlapping portions where things feel they are done twice over, but it sets the scene for what's to follow when the story takes off. I adore books within books, and this was a really fun portion that drew me in. Throw in the fact that this is a popcorn thriller with page turning prowess, and I was there. My major issues here were that the voices of the teens did feel very... well... not teen. It felt like an adult trying to talk like a teen ("I'm not like those other moms, I'm a cool mom") and that it was fairly predictable and formulaic after the initial uniqueness of the two narratives wore off. This could just be me reading as an adult though, and if you're into these types of books chances are it won't affect your reading experience. Glad to have read this and love the cover to pieces! I thought the premise of Copycat sounded great, but unfortunately it was hindered by subpar writing. Addie is a super fan of the series Gap Lake and when the allusive author contacts her to help promote the latest release, she jumps at the chance. However, when strange parallels between the book and real life start happening (like the most popular girl at school being murdered), Addie begins to wonder if it's really the author who's sending her these emails. This review has been hidden because it contains spoilers. To view it, click here. Content warnings include alcoholism and dating violence. This book took me back to the Point Horror books of my childhood (if their characters swore). Addison is a 17 year old who is obsessed with a series of books and writes fan fiction on her popular blog. Reader dream #264 comes true for her when the mysterious author of the Gap Lake books contacts her and asks for her help in generating buzz for the upcoming series finale. Addison and her best friend Maya stumble upon the body of the most pop Content warnings include alcoholism and dating violence. Addison and her best friend Maya stumble upon the body of the most popular girl in school, the details of which eerily mimic those of the snippets of the new book the author has asked Addie to post on her blog. Addie begins to wonder whether the person contacting her really is the author or if she’s talking to the killer. While there was nothing specifically wrong with Addie’s character it was Maya that made the book for me. I loved her snarky quips and the banter between her and Addie. Spencer, ex boyfriend of the dead girl and Addie’s crush, and Colton, who is not so secretly in love with Maya, both felt mostly two dimensional. I wasn’t a fan of Addie’s dad or Maya’s parents, although I’m fairly sure Mr Garcia could twist my arm and force me to eat some of his cooking. I loved the snippets of the Gap Lake book that the author sends Addie as they had a creepy teenage horror vibe. I’ve read so many books like this and am a lot older than the target audience so I found the plot really predictable and I knew who was responsible for the murder early on. Had I read this as a kid I expect the whodunnit aspect probably would have floored me. The explanations espoused during the baddie monologue are quite groan worthy. I was fortunate enough to have an ARC but life happened so I read it after its release. This became a fun game for me once I realised that the library book in one hand and the Kindle in the other didn’t always match. I preferred the ARC, mostly because there are two missing chapters in the final version. Not a lot happened in the first one but without it the continuity was off and I did flip back through the pages of the book to try to work out what I’d missed before I realised the ARC version made the story flow more smoothly. My favourite difference between the ARC and the final version is totally irrelevant to the story itself but talked about food which always holds my attention. In the ARC Mr Garcia gives Addie “lessons on making something like gumbo or étouffée”. In the final version it’s his “signature enchiladas”. I had a few irks and question marks while reading and think I may have tripped over some plot holes but there was nothing that made me want to stop reading. Early on we’re told multiple times that Maya’s mother is the chief of police and her father is a homicide detective. I got it the first time. The descriptions of Addison’s saliva were also repetitive and included “Addison’s saliva tasted sour”, “Her saliva soured”, “her saliva going sour”, “saliva that tasted like hot metal”, and “her saliva tasting bitter”. Addison’s phone pinged twice and another character mentions how insistent the person sending the message is. When Addison checks her phone there’s one message, not two. (view spoiler)[When her blog was hijacked I screamed at Addie to take some screen shots so she had some evidence but alas, she didn’t hear me. There were a few others but you get the point. It’s the sort of thing you expect to be picked up during the editing process and because I wandered through several ‘huh?’ moments I started questioning whether I was stupid, having missed a whole pile of information, or whether I was super smart for finding them when those before me didn’t. I’m still unsure. Addison is a teenage girl who is the biggest fan of R. J. Rosen, an author of suspense. He writes the Gap Lake series and Addie has read every word in every book at least 10 times. She has a blog of all things Rosen that now has thousands of followers. She is excited beyond belief when she is contacted by the author. He's impressed with her fandom and offers her the opportunity to help him with his newest book. He follows by sending her quite an excerpt sending Addison into a head spin with a note telling her a surprise will follow. Unfortunately that surprise is the murdered body of a school friend. When Addie realizes that the murdered girl is exactly described as in the newest book. Life imitating art? And then the author sends a note ... Did you like my surprise? I don't read a lot of YA mystery, but the book blurb drew me in. I liked the teenage characters, most of the conversation was very much reminiscent of my own children at that age, although it's hard to fathom that they were allowed to investigate they way they did. It's heavy on the action, slightly less on the suspense. Many thanks to the author / Sourcebooks Fire / Netgalley for the digital copy of COPYCAT. Opinions expressed here are unbiased and entirely my own. Addie runs an online blog for the popular Gap Lake Mystery series and is over the moon when the reclusive author contacts her through email to promote the latest book in the series. But soon life starts imitating fiction especially when a popular girl is murder in Addie’s school. When other strange things from the book start happening around her Addie knows she has to figure out who the murderer is before she or her loved ones get hurt. Copycat is a fairly good YA read with a fairly decent mystery . My only problem was that I could not connect with the characters but I’m sure people who like this genre might enjoy it. I would like to thank Sourcebooks Fire & NetGalley for providing an ARC of this book in exchange for my honest and fair review. Yeah, this wasn't a great read for me. Granted, I've been in some kind of weird reading slump lately - I want to read, but I'm not enjoying anything I pick up. There are a few positives. Copycat is a quick read and doesn't require much headspace. Perfect for when you need an easy breezy read. I also really liked the parallels between the Gap Lake series and the murder. For me, that's where the positives end. None of the characters really came alive. The way they talked made it quite obvious that t Yeah, this wasn't a great read for me. Granted, I've been in some kind of weird reading slump lately - I want to read, but I'm not enjoying anything I pick up. For me, that's where the positives end. None of the characters really came alive. The way they talked made it quite obvious that the author was an adult, and there wasn't much chemistry between any of them. On top of that, the big reveal of murderer and motive was predictable and unsatisfactory, and the ending wrapped up too quickly. If it had managed to surprise me with a twist, I might have given it 3 stars. As it stands, I'm giving it 2: it was okay. I picked up Copycat for a fun summer read - something my friend Chelsea at The Suspense is Thrilling Me refers to as "popcorn reads". I knew this was a YA thriller, which is always something I'm a little reluctant about, because those can be hit or miss for me, given the fact that I read so many regular/adult thrillers. What I did like about this book was the plot. There was a "story within a story" aspect to the plot, and I generally enjoyed the concept of killings mirroring an unpublished book I picked up Copycat for a fun summer read - something my friend Chelsea at The Suspense is Thrilling Me refers to as "popcorn reads". I knew this was a YA thriller, which is always something I'm a little reluctant about, because those can be hit or miss for me, given the fact that I read so many regular/adult thrillers. What I did like about this book was the plot. There was a "story within a story" aspect to the plot, and I generally enjoyed the concept of killings mirroring an unpublished book. It was easy to read, and on the shorter side, so I ended up reading most of it in one setting. It was engaging, and I did find myself sucked into the story. That said, there were some things I didn't enjoy as much. Largely, that was the fact that I felt like the book was REALLY predictable. I was able to pin the killer from really early on. The other thing that took me out of the story that many other reviewers mentioned, was the dialogue. The book was written from the POV of a high school girl, but didn't read like a high school voice. It definitely felt like an adult trying to write as a teenager, and I struggled with that a little bit. This book was so much fun to read! I do love a good young adult book that I can get lost in and this was certainly that. A very quick read with a story that will have you hooked. A book about a book obsessed teenager called Addison. She is obsessed with the Gap Lake mystery books and has a very popular blog as well. She receives a message from the author inviting her to help with the promotion for the new book she is thrilled. But then the most popular girl in school is found murdered.. and life This book was so much fun to read! I do love a good young adult book that I can get lost in and this was certainly that. A very quick read with a story that will have you hooked. A book about a book obsessed teenager called Addison. She is obsessed with the Gap Lake mystery books and has a very popular blog as well. She receives a message from the author inviting her to help with the promotion for the new book she is thrilled. But then the most popular girl in school is found murdered.. and life starts to imitate the books. Is she really talking to the author or is it a murderer? Is she safe? Addie writes fan fiction for her favorite mystery series. She can hardly believe when the writer notices her work and asks her to help with publicity for the last book of the series. But soon murders that mimic the books begin happening. Is life imitating art? The premise of COPYCAT and having read some of Hannah Jayne’s books previously inspired me to request the ARC. Addison was a likable main character, I could practically feel her teenage enthusiasm for reading and writing. Her excitement at being contacted by Spencer felt organic. COPYCAT moved at an even, medium pace. The dialogue was the weakest part of the story. It felt like an adult writing for a teen, rather than a teenager actually speaking. If the mystery aspect had a few surprising twists or a gotcha moment, I would have rated #COPYCAT higher. This is an intriguing story of a teen fangirl who discovers that sometimes the stories she's so addicted to and blogs about are being reenacted in reality - including a popular peer being murdered. As Addison finds more aspects of the book really happening but no one believing her, contact with the author of the books proves even more dangerous for Addison and those around her . . . . This is a suspense filled teen murder mystery, a somewhat gruesome read and a real page turner. It has great char This is an intriguing story of a teen fangirl who discovers that sometimes the stories she's so addicted to and blogs about are being reenacted in reality - including a popular peer being murdered. As Addison finds more aspects of the book really happening but no one believing her, contact with the author of the books proves even more dangerous for Addison and those around her . . . . This is a suspense filled teen murder mystery, a somewhat gruesome read and a real page turner. It has great characters, each with their unique teen take on life and relationships which are explored further as the mystery progresses. The diverse relationships between peers and adults are explored through the story. There's plenty of tension which develops further as Addison discovers that she really needs to change the ending of the story to enable her to survive! It is a fast paced read with plenty of twists and turns to keep you guessing - I certainly hadn't guessed who was responsible for the murder! More like a 3.5. I have enjoyed all the books I have read by this author, but this felt a little young for me. Interesting plot, but I wasn't very shocked by the reveal. In a book that had a lot of similarities to my own involvement with blogging and the literary world I was eager to see what sort of mystery was in store but instead I got a bit of a mess. “Copycat” tells the story of Addie, a book blogger and aspiring writer who dedicates her time to the mystery/thriller Gap Lake series is given the opportunity to share snippets for the upcoming novel from the author himself but when a classmate is murdered and the crime scene is eerily similar to what happens i In a book that had a lot of similarities to my own involvement with blogging and the literary world I was eager to see what sort of mystery was in store but instead I got a bit of a mess. “Copycat” tells the story of Addie, a book blogger and aspiring writer who dedicates her time to the mystery/thriller Gap Lake series is given the opportunity to share snippets for the upcoming novel from the author himself but when a classmate is murdered and the crime scene is eerily similar to what happens in the book, Addie discovers that sometimes life really does imitate art. Let’s start with the positives, as someone who has a book blog and a few interactions with authors myself every reaction Addie had to that experience was very similar to my own, including the lack of enthusiasm by everyone who happen to not be as invested as you so it was easy to connect with her in the beginning but then things sort of went off the rails. It’s a bit clunky and repetitive in the beginning as it sets up a duel narrative with reality paralleling the fictional world of Gap Lake so when the murder takes place as a reader you can follow along with the similarities to the book within the book. In a sort of ‘Pretty Little Liars” scenario things go wrong pretty quickly and there’s more than a few moments where you are left sitting there scratching your head because things aren’t adding up. The motivation and the murderer itself was a huge let down I actually thought it was going to be someone else so when the reveal happened it was almost too obvious and sort of lazy and the entire reasoning for why made sense somewhat but for the whole other part later it comes out of left field to the point that I didn’t even care anymore because it was so ridiculous, not to mention that we spend a good amount of time trying to solve this mystery just for it to wrap up with a nice bow and all other plot points join in that picture perfect resolution in a matter of maybe 3 pages. I can see how some people might like this, especially if you are a fan of the PLL type villain behind a screen but for me this was a disappointment. It’s very rare for me to get this excited about a book, but this is one of the rare times. I’m so upset with myself that I didn’t read this sooner. I mean I’ve had this ARC for a quite a while in my shelf but I just never got to reading it. And I’m very glad that I did. Addison Gaines, a high school student is obsessed with mystery author R.J Rosen so when he reaches out to her to ask her to work on a project with him, she is ecstatic. But when he starts sending her snippets of his new book, and the events start to happen in real life, she begins to question whether this is the really author or himself, or a copycat. Wow wow and wow! It was just so astounding I couldn’t stop. I’m literally in bed right now writing out this review at 2 a.m in the morning. I just had to finish it! The concept was very interesting. A fan obsessed with an author. Sounds so simple, yet so complex. I didn’t know how this would work but it did. The thriller aspect is really apparent in the novel and I got chills reading this one. The characters were so brilliantly written, the plot so enthralling and the novel so fresh! It’s like nothing I’ve read before Andy only stay up really late to finish books that I find to be worth it, and this one was. Plot twist I did expect but this did not at all take away the enjoyment in reading the novel. It was just so creepy! Jayne writes in such a great fresh new voice and it just creeped me out! If this is how all Jayne novels are, then I’m an immediate fan! Highly recommend, it’s just great. It was an interesting premise with the main character being Addie who is obessed with a mystery book series called Gap Lake, she even has her own blog and writes her own fanfiction. Then one day Addie is contacted by the author of Gap Lake and she is beyong thrilled. Then my This book in my opinion had a lot of similiarities to Pretty Little Liars in the way that it was written. It was well written for the most part, albeit a bit dark and gruesome. The plot twists for the most part were expected. The characters were a little lacking as there wasn't a super large cast of characters. Overall, I gave this book 3 out of 5 stars because it was enjoyable to read but it was easy to guess "who-dun-it" (in my opinion). This was a fairly good YA mystery about a teenager who is a fan girl. Addie loves everything that RJ Rosen writes, and has a blog with hundreds of followers who feel the same way. But when a classmate is found dead, art imitates life, and Addie begins to feel creeped out by the personal messages she is getting from Rosen. Thanks to the publisher and NetGalley for allowing me to be an early reader in exchange for my fair and honest review. I really enjoyed Hannah Jayne’s Copycat. An easy to read suspenseful thriller for young adults, this book kept my attention from cover to cover. Addie is author R.J. Rosen’s biggest fan. She even has a blog where she writes fan fiction in honor of his series. When he reaches out to her to help him promote his next book she doesn’t hesitate. Working with Rosen is her dream come true, but when disturbing things begin to happen around her, including finding a fellow student dead in the journalism room, she begins to wonder who she can trust and who could be behind the mysterious death that mimics the fiction mysteries she loves so much. As the danger begins to ramp up, so does her need to find the person responsible. Will Addie be able to solve the real life mystery before she becomes the next victim? Addie’s best friend Maya was fantastic. I think she was actually my favorite character. She was snarky and sarcastic and I found her personality humorous and entertaining. Some other reviews said her character felt unrealistic, but I respectfully disagree because she reminded me a bit of my husband. A little blunter than most, but it’s hard to not like someone who just says it like it is. At least Addie always knew where she stood with Maya. I am a huge mystery, suspense and thriller fan, and while this was not the most complicated story line, and even though the great reveal was not super twisty, I still really enjoyed reading this one. It was entertaining, humorous at times, easy to read, and suspenseful enough to make my pulse race. I would highly recommend this one for someone who wants an easy to read mystery. Addison is obsessed with the murder mysteries written by R.J. Rosen, to the point of reading each book over and over again. When he gets in touch one day to ask her to be part of the team creating exposure for his new novel, she is absolutely ecstatic. I can understand her excitement and bookworm joy at being picked to work with the author of the books she absolutely adores. Being able to share her own ideas in the form of fan-fiction. Gaining recognition and attention via her blog, it all gives Addison is obsessed with the murder mysteries written by R.J. Rosen, to the point of reading each book over and over again. When he gets in touch one day to ask her to be part of the team creating exposure for his new novel, she is absolutely ecstatic. I can understand her excitement and bookworm joy at being picked to work with the author of the books she absolutely adores. Being able to share her own ideas in the form of fan-fiction. Gaining recognition and attention via her blog, it all gives Addie a sense of security and achievement. Her joy quickly turns to fear when life begins to imitate the fictional stories on her blog. Addison is torn between her love for the books and the cruel reality of life. In a way her reading is a form of escapism. With a nose in a book she doesn’t have to think about the relationship she has with her father or the insecurities she has about herself. It’s an intriguing premise, and in our day and age of anonymity behind social media accounts, perhaps not such an unrealistic idea. Although this is a YA and features very young characters, I think it would also work well with older characters. Jayne makes a point, albeit subtly about online popularity, and how fast the flighty opinions of social media users can change. One day you’re a star and the next you’re the scum of the earth. The winds of change on the world wide web are unpredictable. It’s perhaps best not to take yourself too seriously or any kind of supposed status you think you have on the internet. That’s the kind of advice someone should have given to Addison then maybe she wouldn’t have walked right into the trap of a killer. Copycat has the charm of Pretty Little Liars, but with less conniving and more genuine emotions and a loyal friendship. I would genuinely love to know how many bookworms would fall into the same trap, a murderous game fuelled by the fears and hopes of a young girl. A YA thriller, Copycat asks the question; what if your love of fiction became a very real threat to your existence? Addie shouldn’t have a care in the world. She’s young, pretty and well-off. Her fan blog for the incredibly popular Gap Lake murder mystery book series is getting serious traction, and when she receives an email from the mysterious author inviting her to participate in the next book’s release publicity, she’s over the moon. Soon things start turning weird, though. The discovery of a A YA thriller, Copycat asks the question; what if your love of fiction became a very real threat to your existence? Soon things start turning weird, though. The discovery of a murdered classmate killed in an almost identical manner to a victim in the first book is just the first in a chain of steadily increasing incidents. When her best friend is almost murdered, Addie’s absolutely convinced she’s next on the hit list. This was very well crafted, with a steady increase of stakes and tension, and very real characters. I didn’t see the final twists coming at all (in fact I suspected completely the wrong person!) but they were logical and fit perfectly well with the plot. The characters felt true to life for teenagers, using appropriate language, actions and thought processes for their age group. Despite that, it didn’t feel too juvenile for adult readers and I was thoroughly caught up in the story. I hadn’t heard of Hannah Jayne before I picked this one up for review and I don’t read a lot of YA, but I’ll definitely be looking out for more books by this author. Five stars. I received an advanced copy of this title from Netgalley in exchange for an honest review. Honestly, this book wasn't hard to read and it wasn't boring, I was however glad that it was short so I could breeze right through it and be done with it. I didn't exactly hate it, but I didn't enjoy it either. I have a lot of opinions that I'm going to get into. If you're looking for an exciting mystery/thriller that isn't really that long or complex, then I guess this book might be for you. I received an advanced copy of this title from Netgalley in exchange for an honest review. If you're looking for an exciting mystery/thriller that isn't really that long or complex, then I guess this book might be for you. If not, I'd say you're just better off leaving this one off your reading list. Within the first few pages, I noticed that the dialogue was... clunky, to say the least. I'd say the first good while of the book is literally just dialogue, and the dialogue of these characters is barely even interesting enough to keep one interested reading characters talking to each other and little else. And then, after a while of just talking, somebody dies. I wrote this down in my notes, the major event hinted in the synopsis literally happens page 28. And this is the event that the entire plot is based around. The pacing is not the best. We've now just witnessed a major plot-altering event, and then you have a long period of time where pretty much nothing happens, and then the climax of the story. And that's a whole other point I'll get to. Clues were just dropped way early in the story, and they weren't spaced out at all, and so by the end all of these clues hidden in the story barely even matter anymore because nobody remembers anything that happened that long ago in the story, we were all trying to just skim-read to get through this book. You know what adds to the wonky pacing? There are so many chapters for literally no reason. There could have been way less, and 85% of all the chapters end at the weirdest points and some just end abruptly right in the middle of a character's conversation. I'm not sure if this is some tacky way of ensuring a reader can never afford to put the book down as a result of constantly wondering what'll happen next, but there is a way more tasteful way to do this effect and ending chapters at random times in the story is not it. The adult characters weren't written very believable at all. I'm pretty sure law enforcement is required to take online threats, especially timed with bodily harm of other characters, at least a tad bit seriously when presented to them. And Addison's dad? He was just a mess of a character. And now, I'll address the ending. I don't want to give away anything, but basically, the story is a whole contradiction of itself and popular tropes it addresses in the text. The villain is completely expected but at the same time, not. And, I find it unbelievable that he would go through so much effort just to drive Addison crazy when she had nothing to do with the situation in which his motive lies. Why couldn't he just go for the person he was really mad at? This made no sense to me, and this motivation pretty much came out of nowhere. Addison's backstory seemed kind of unwarranted for a long period in the story, but then it all comes together or tries to, in order to bring forth a giant climactic reveal of the villain and his motive. In my opinion, this didn't really work that well, and instead seemed to me like a huge, useless backstory referenced time and time again for no reason to loosely explain a motive that may or may not have been thought of last minute. The story didn't feel tied together at all. I will say, this book wasn't entirely displeasing. Maya was a great character and I feel as though she pretty much saved the story for me. I really enjoyed her, but she's pretty much the only one. 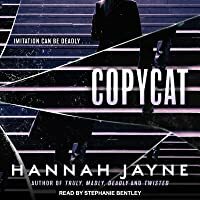 Having read Hannah Jayne novels before, I knew I wanted to check out Copycat. Jayne has a way of telling a story that draws you in, and nobody which way the story goes, you always want to know how it ends. Copycat did that. The story follows Addison, number one fan of the Gap Lake seires by author R.J. Rosen. She runs a popular blog about the series and writes her own fanfiction. Then she gets an email from the author himself asking her to be part of his reveal for his next book, but the pieces he gives her are very similar to real life playing out in her town as kids start coming up dead from freak, but gruesome and violence deaths. I loved the mystery of this novel. As a lover of books, I loved the book nerd qualities of Addison. I can appreciate her love for the ficticious world and all that goes along with it. The characters were detailed and inventive, matching up with people any reader could relate to in their everyday life. I was a little put off by the insistencey and almost childish thought process of Addison where her love of the novels became a bit of an obsession in terms of constantly bringing it up in inappropriate times. I found that an occassional mention due to the situation approrpriate, but other times it was more annoying. And maybe that is what Jayne was going for, because Addison's best friend sure was getting annoyed, but I found it took more from the story than added to it. With that being said, I feel the core of the story kept the book flowing and kept me guessing until the very end. I never guessed right either! I was wrong every time. I love a good mystery novel that leaves me questioning the "who done it" at the end. I was fortunate to receive this novel as an Advance Reader Copy, in exchange for an objective review. Addie Gaines is your typical high school student, with one exception. She loves books and is particularly infatuated with the Gap Lake books – a series of young adult mystery/thrillers that have developed quite the cult following. Addie is so entranced, she’s created her own blog about the series, and has written some fan fiction as well, that rivals the authors storytelling. She lives and breathes the series, and her blog has 27,000 followers. She’s also president of author R.J Rosen’s fan club! Out of the blue, Addie receives a message from the reclusive author himself, praising her devotion to the series and offering her a sneak peak into the newest book, and hinting that there will be surprises along the way. Shortly thereafter, a classmate winds up dead, in a manner straight out of the Gap Lake series. Coincidence? Or is it something much more sinister?? Addison Gaines is a super-fan of RJ Jenson's Gap Lake mysteries. She has a blog, writes fan fiction, the whole thing. Then, one day RJ Jenson himself contacts her to ask if she'd be willing to help promote the next book. He'll send her snippets to share on her popular blog, as well as other surprises. The first surprise is the corpse of one of her classmates, posed in the journalism classroom ... where Addie finds her. And the murder is eerily reminiscent of the snippet she was given to share. Soo Addison Gaines is a super-fan of RJ Jenson's Gap Lake mysteries. She has a blog, writes fan fiction, the whole thing. Then, one day RJ Jenson himself contacts her to ask if she'd be willing to help promote the next book. He'll send her snippets to share on her popular blog, as well as other surprises. Soon, RJ's texts become more threatening ... and Addie realizes that she is in danger. I don't read a lot of fiction aimed at young adults; I'm way past the target audience. I do, however, like a good "whodunnit" regardless ... and this is just such a book. I began to suspect the culprit about halfway through, but desperately wanted to be wrong! I. Loved. This. (Ok, full disclosure, I haven't quite finished it, but what I have read is awesome). I'm really enjoying this recent crime-wave of YA books, and this one is nice in that it's different! Famous blogger who blogs about her favourite mystery/thriller series (and writes fanfic!) is contacted by the reclusive author of the books. He wants her to help with the publicity buzz leading up to the release of his new book, and begins an online correspondence with her. When our hero finds the I. Loved. This. (Ok, full disclosure, I haven't quite finished it, but what I have read is awesome). I'm really enjoying this recent crime-wave of YA books, and this one is nice in that it's different! Famous blogger who blogs about her favourite mystery/thriller series (and writes fanfic!) is contacted by the reclusive author of the books. He wants her to help with the publicity buzz leading up to the release of his new book, and begins an online correspondence with her. When our hero finds the body of a murdered classmate in circumstances eerily similar to the advance chapters of the new book, she is understandable worried. Add in a cryptic message that might or might not be about the murder, and it's all go. I felt the characters were well developed; we learned enough about each one to feel they were a real person without random copious info dumps. The main character Addie runs an online blog for her favourite book series and when it starts gaining popularity the author contacts her about doing exclusives for her blog. Then the murders start which are VERY similar to the murders in the Gap Lake series. Is it a copycat killer, the author, somebody Addie knows??? In a small town happened a murder and two high school's girls had seen the body and who could have do it. Mixed that with a suspense series being copycat by the murderer? The execution was pretty general and did not fear for one minute to the life's of Addie and Maya. Addie has the perfect life, a crush and a BBF who is jeauslous of her life and said that in every oportunite. The killer and the motivation was not beliavable. There is not much of us to feel sorry about just what the hell?? The adul In a small town happened a murder and two high school's girls had seen the body and who could have do it. At first, I thought this book would be a perfect combination of Eliza and her monsters/Radio silence and mystery stories, but it ended up letting me down. I expected to see a serial killer case, but all I received were a subpar writing and a bad plot. CopyCat had such high hopes but fell flat quickly with the chunky dialog, fell into the Pretty Little lairs type of story but lacked the creative writing needed to pull off the story. The characters were unlikable. The motivation behind the murderer and reason couldn't have been a bigger let down because most readers will have figured it out right away. Only thing kept me reading was hoping that I was wrong. The friendship didn't feel read and left me wondering why the author chose this route? Th CopyCat had such high hopes but fell flat quickly with the chunky dialog, fell into the Pretty Little lairs type of story but lacked the creative writing needed to pull off the story. The characters were unlikable. The story is flat, Predictable and boring. Copycat is a story that had an interesting concept but didn't live up to it, while relying on old tropes. The story begins when Addison gets an email from her favorite mystery author, writer of a series she is a bonafide super-fan of, regarding making some promotional posts about his next book. Innocent enough, right? That is, until she realizes a classmate gets murdered in the exact way the excerpt she was sent. After that, she starts to worry that life is starting to imitate art, but (a) no one takes her seriously, and (b) the police are pretty much incompetent. - Earlier on in the novel, she is told by the 'author' that he found her through her fanfic. Knowing the book community and how authors are adamant about not reading fanfic because of copyright and plagiarism claims, that should have sent the warning bells ringing in her head. - There is no mention of any DNA evidence throughout the book, even though there was a struggle, and the fact that the 'killer' didn't exactly seem the kind of people who would be careful about it. - The police have only one suspect and we don't even know what or why he is let off the hook (like, did he have an alibi?). Addison provides clues to them yet they don't really act on it much until the end. - The motive and Addison's hatred for her dad did not make much sense in the context. The voice of Addison might also feel like it is trying to sound teen-like but juuuust falling shy of nailing it. Additionally, while I liked the flashbacks, I think as a mystery, it would have made more interesting by not indicating first that it was a flashback or dream. And honestly, it going the psychological route would have added to the tension, but we get an easy mystery, with barely any red herrings (at one point, Addison is like - he is an adult so it could be him) and not much excitement. Sure, it was fast-paced, but speed alone couldn't build the urgency or the high stakes that a story like this deserves. Overall, it is a good mystery, but if you a regular reader like me, or one who likes to solve the mysteries while reading, it might not be that enjoyable. This book caught my interest from the first chapter. I quickly found myself engrossed in the story, the mystery, and the characters who had to live through it. The concept of this book caught my attention quickly-- I love crime fiction, so reading about someone who loves reading and writing about crimes, then has to go through one sounded really interesting. I was hoping she would see through potential tropes and solve the mystery herself. This, I will say, was one of the biggest letdowns for me. Addy is kinda naive for a person who reads so much about crimes-- even if they are fiction. Some things happened that had me shaking my head over-- although there was thing I thought would lead to a huge cliche thing that just... wasn't ever brought up again, so that was a nice dodge, I guess? The writing style was very much a style I liked. It is easy to read and not bogged down in too much detail, just enough to get you hooked in the story and wondering what will be important. I was sucked into the story so I wasn't able to pay attention to much else, but there were a few things that did stick out though.The chapter breaks were weird at times and just didn't make sense, like in the middle of a conversation. Also, the police were written to be absolutely useless. This is a peeve because I hate when police seem to do little to no investigation and then blame the main character based off info they have, not what the main character finds. It can be frustrating. All this I could deal with, just minus half a star, but I took a star away for how events in the book didn't seem to connect or have impact. Something happens that honestly makes someone look bad, or discredits them yet it isn't mentioned at all later??? "Oh, that person threatened me, but I'll still care about what they say and won't mention it to my friends or cops." --Seriously??? AND when asked if there was a reason to not trust them, it isn't even mentioned. This totally brought me out of the story. The ending also didn't seem to connect to the past as much as I thought it could-- in fact I wanted to know more about the accident and what happened to Addy's mom. As a good note, I loved the relationship between the girl characters. There is no jealousy-filled feuds, Addy and Maya talk about things besides boys *gasp* and have an all around great friendship. Hannah is the author of the UNDERWORLD DETECTION AGENCY CHRONICLES from Kensington books and the upcoming young adult thrillers TRULY, MADLY, DEADLY and SEE JANE RUN available from Sourcebooks, Inc. When she's not battling the demons of the Underworld or tackling a murderer at Hawthorne High, Jayne kicks her feet up in her San Francisco bay area home and attempts to share couch space with two enor Hannah is the author of the UNDERWORLD DETECTION AGENCY CHRONICLES from Kensington books and the upcoming young adult thrillers TRULY, MADLY, DEADLY and SEE JANE RUN available from Sourcebooks, Inc. When she's not battling the demons of the Underworld or tackling a murderer at Hawthorne High, Jayne kicks her feet up in her San Francisco bay area home and attempts to share couch space with two enormous cats.